Here we present a low cost, durable cryotolerant device for sample retrieval from Dewar tanks filled with liquid nitrogen. The ease of construction and modular design of the device makes the process of sample retrieval from cryogenic tanks safe and easy. Mehta, R., Baranova, A., Birerdinc, A. Do-It-Yourself Device for Recovery of Cryopreserved Samples Accidentally Dropped into Cryogenic Storage Tanks . J. Vis. Exp. (63), e3903, doi:10.3791/3903 (2012). Liquid nitrogen is colorless, odorless, extremely cold (-196 °C) liquid kept under pressure. It is commonly used as a cryogenic fluid for long term storage of biological materials such as blood, cells and tissues 1,2. The cryogenic nature of liquid nitrogen, while ideal for sample preservation, can cause rapid freezing of live tissues on contact - known as 'cryogenic burn'2, which may lead to severe frostbite in persons closely involved in storage and retrieval of samples from Dewars. Additionally, as liquid nitrogen evaporates it reduces the oxygen concentration in the air and might cause asphyxia, especially in confined spaces2. In laboratories, biological samples are often stored in cryovials or cryoboxes stacked in stainless steel racks within the Dewar tanks1. These storage racks are provided with a long shaft to prevent boxes from slipping out from the racks and into the bottom of Dewars during routine handling. All too often, however, boxes or vials with precious samples slip out and sink to the bottom of liquid nitrogen filled tank. In such cases, samples could be tediously retrieved after transferring the liquid nitrogen into a spare container or discarding it. The boxes and vials can then be relatively safely recovered from emptied Dewar. However, the cryogenic nature of liquid nitrogen and its expansion rate makes sunken sample retrieval hazardous. It is commonly recommended by Safety Offices that sample retrieval be never carried out by a single person. Another alternative is to use commercially available cool grabbers or tongs to pull out the vials3. However, limited visibility within the dark liquid filled Dewars poses a major limitation in their use. In this article, we describe the construction of a Cryotolerant DIY retrieval device, which makes sample retrieval from Dewar containing cryogenic fluids both safe and easy. Using pliers, straighten out one side of 3 sided strong-tie (Figure 1A) to make an L shaped strong-tie shown in Figure 1B. Note: The dimensions of strong-tie can be selected depending on the diameter of the neck of Dewar. Secure two such strong-ties with a strong-tie T strap (Figure 2) using Crown bolt nut, washer and screw to form the Cryoscoop base as shown in Figure 3(A-B). Note: Two strong ties are used to allow retrieval of 5 ½ in. X 5 ½ in. cryoboxes. 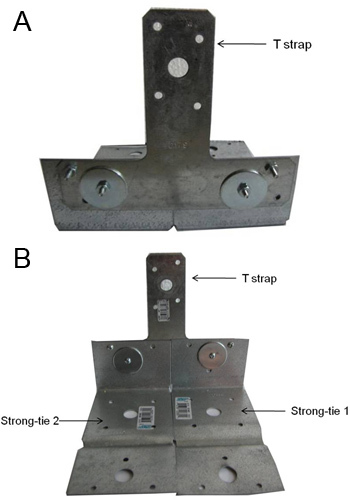 Using a slotted plate (Figure 4), align the slots on the strong-tie T strap with the slots on one end of the slotted plate and secure the two together with help of Hillman nut and bolts (Figure 5). Note: If the slotted plate and strong tie's does not come with pre-drilled holes, you will have to have holes drilled using carbide drill bit. Bend the other end of the slotted plate with the help of pliers as shown in Figure 6. (This step is optional). 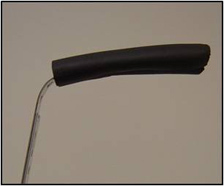 Wrap the handle with foam to better grasp the device when in liquid nitrogen as shown in Figure 6. (optional) Note: Remove the foam prior to autoclaving. The Cryotolerant DIY retrieval device can also be adapted for retrieval of cryovials. 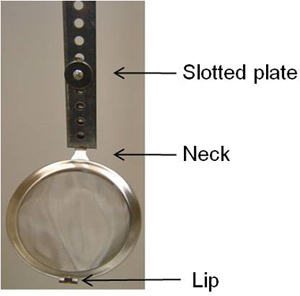 This involves substituting the flat base with a stainless steel strainer as shown altered for scooping out vials from liquid nitrogen (Figure 7). Unscrew the Crown nuts and bolts attaching the strong-tie T strap to the slotted plate. Before attaching the stainless steel strainer to the slotted plate, gently bend the neck of the strainer with the help of pliers to orient the base at an angle to resemble a ladle (Figure 8). Note: If the strainer comes with a lip, use pliers to bend the lip down; this will make maneuvering with the device easier. Align the hole on handle of the strainer along with the holes on the slotted plate and secure the strainer with help of Hillman nuts and bolts as shown in Figure 8. Note: if the strainer does not come with pre-drilled holes, you will need to arrange to have holes drilled with carbide drill bit. To begin, put on cryogenic gloves and remove 1 or 2 freezer racks from the Dewar to allow room for maneuvering. Gently scrape along the bottom of the Dewar with the upright Cryotolerant DIY retrieval device fitted with strong-tie T strap base (Figure 5) and collect the box fallen to the bottom of the Dewar tank. Note: Liquid nitrogen boils immediately on contact with a warmer object, enveloping the object in insulating nitrogen gas (Leidenfrost effect). To cool the device prior to retrieval of samples, slowly immerse the device into the Dewar and allow liquid nitrogen to cool the device sufficiently before proceeding with the above step. Pull the device upright along the walls of the Dewar to scoop the freezer box out of the tank. Grab the box retrieved from the bottom of the Dewar. For retrieving cryovials, gently scrape the bottom of the Dewar with the cryoscoop fitted with a strainer (Figure 9). Similar to cryobox retrieval, pull the device upright and grab the vials collected in the strainer. A major challenge in gene expression studies is that the quality of RNA depends on the storage conditions for both frozen tissue samples and extracted RNA4. Figure 10 shows the effect of sample handling on integrity of total RNA. Total RNA from the same tissue source (human adipose) was subjected to different sample handling. Prior to experiment, intact total RNA preparate shows clear 28S and 18S rRNA bands with the 28S rRNA band approximately twice as intense as the 18S rRNA band (Figure 10, lane 1). This 2:1 ratio (28S:18S) is an indication that the RNA is intact, while partially degraded RNA appears as a smear, or its 28S:18S intensity ratio departs from 2:15. Lanes 3-4 depicts RNA samples with significant degradation. These RNA samples were subjected to repeated partial defreezing by short-term retrievals from the Dewar (Method A), thus modeling long term storage with periodic decanting due to necessity of the retrieval of the fallen vials and boxes (Figure 10, Lane 3-4). However, samples stored in Dewar serviced using DIY device (Method B) and, thus, no partial defreezing, contain intact RNA (Figure 10, Lane 2). Figure 1. A) The base consists of two 3 sided strong-tie of shown dimensions. Each strong-tie contains one large pre-drilled hole (solid arrow) and multiple smaller holes (small arrow) on each face. This provides an option to allow fastening with nut and bolts. Also the smaller holes allow rapid drainage of liquid nitrogen during sample retrieval. B) One side of each of the strong-tie is straightened with the help of pliers to make L shaped strong-tie. Figure 2. Strong-tie T strap is used to secure the strong-ties together. Like strong- tie, T-strap has one large pre-drilled hole (solid arrow) and two smaller holes (small arrow) on each corner. This allows securing strong-ties along the length of the T - Strap using nuts and bolt. It also enables fastening T-strap to the slotted plate. Figure 3. A) Each strong-tie is fastened to one corner of T-strap, along its length using crown bolt nuts, bolts and washers. B) Two strong-ties are secured adjacent to each other to help retrieve 5 ½ in. X 5 ½ in. cryoboxes. For smaller cryoboxes such as 2 in. X 2 in. , a single strong-tie can be fastened directly to the slotted plate without a T-strap. Figure 4. Slotted flat plate is used as the handle. Length of the slotted plate depends on the depth of the Dewar. In this case, 4 feet of slotted plate was used. 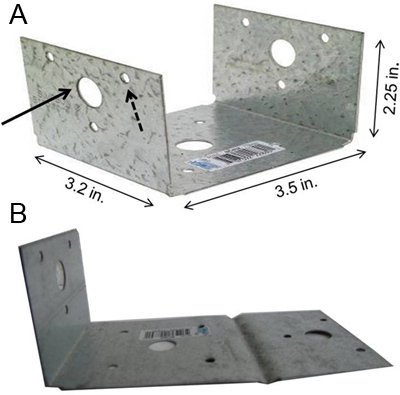 The thickness of slotted plate is critical since thin slotted plates (<14 gauges) make the device flimsy while retrieving samples from liquid nitrogen filled Dewar. Figure 5. The flat base consisting of strong-ties and T strap is then secured at one end of the slotted plate. 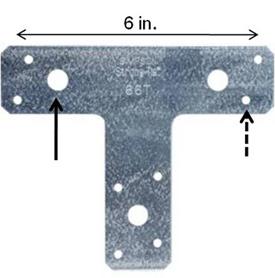 The larger hole on the remaining corner of T strap is aligned with the slot on the flat plate and fastened using hex bolt and nut. This device can be now used to retrieve cryoboxes from Dewar. Figure 6. One end of the slotted flat plate is bent using pliers and covered with foam to provide better grip especially for deep Dewars, as shown in this case. Figure 7. Strainer with wire mesh and stainless steel handle is used to retrieve cryovials from Dewar. If the handle is not provided with a slot, drill with carbide bit will be required for drilling a hole. Figure 8. 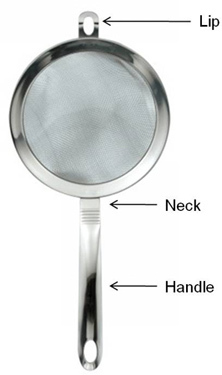 To ease retrieval of cryovials, strainer is bent along the neck using pliers to get ladle shaped strainer. If strainer is provided with lip as in this case, pliers can be used to bend it. This ensures strainer does not get caught within the Dewar. Figure 9. Strainer is secured to the slotted flat plate at one end using hex nut and bolt. Figure 10. Sample integrity of total RNA subjected to different sample handling conditions. To explore how RNA quality is affected by sample handling conditions, a set of RNA samples from the same source was subjected to two methods of handlings. Method A consisted of storage of RNA in Dewar subjected to sample retrievals using DIY device, thus no partial defreezing. Method B consisted of storage of RNA in Dewar subjected to repeated partial defreezing by short-term retrievals from the Dewar, thus modeling long term storage with periodic decanting for retrieving fallen samples. 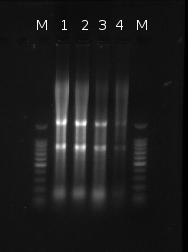 Total RNA integrity was then analyzed by gel electrophoresis. Lane1: Sample before storage in Dewar; Lane 2: Sample from Dewar subjected to retrieval by Method A; Lane 3, 4: Sample from Dewar subjected to retrieval by Method B; M: 100 bp ladder. One of the most common methods of retrieving cryoboxes and cryovials from the bottom of the Dewar tank is to decant liquid nitrogen into a spare container and pull out the samples remaining in the flask or floating in the decanted liquid nitrogen. This is, however, an unsafe practice that may cause cryogenic burns or asphyxiation due to prolonged exposure to liquid nitrogen vapors2. Other common way of retrieval of fallen cryovials involves use of cryovial tongs3. However, the limited visibility within the dark space of the tank filled with liquid nitrogen restricts their maneuverability. The Cryotolerant DIY retrieval device described above provides a cheaper, safer and easier alternative for retrieving fallen cryoboxes and cryovials from the bottom of deep flasks with limited visibility. The ease of handling the DIY retrieval device circumvents the need to empty the flasks prior to retrieval. Moreover, the retrieval of cryovial with the help of said device can be carried out by a single individual. Additionally, the use of the DIY retrieval device substantially shortens the amount of time other samples stored in the same unit spend under ambient temperatures, thereby improving sample storage conditions6,7. Many commonly used materials such as plastic, carbon steel and rubber become brittle in liquid nitrogen, and often fracture under stress8,9,10. The stainless steel or galvanized components used in the DIY device are resistant to damage from sub-freezing temperatures of cryogenic fluids. Furthermore, these components are easily available in local hardware stores and of low cost with the construction of DIY device amounting to less than $50.00. The long handle helps prevent operator from direct contact with the cryogenic fluids and the perforated base and strainer allow instant draining of liquid nitrogen during sample recovery. The rapid retrieval allows minimum exposure to liquid nitrogen vapors making sample retrieval a safer process. Due to its modular design, the DIY retrieval device has the flexibility to be used for either boxes or vials. Further, the simplicity of the design allows the device to be adapted for Dewars of varying shapes and sizes and possibly to work with other types of cryogenic fluids. The use of this device may, however, be limited in the case of cryogenic tanks that do not have a flat bottom. DIY cryogenic retrieval device had been tested in course of the projects "Modeling bacterial protein prenylation in eukaryotic cells using bioinformatics and molecular approaches" sponsored by Mary Louise Andrews Award for Cancer Research program, Virginia Academy of Science, "Physiological Meaning of RNA Editing in Plasma Dendritic Cells" sponsored by The Thomas F. Jeffress and Kate Miller Jeffress Memorial Trust and State Contract 16.740.11.0364 (Ministry of Science and Education, Russia). We would like to thank Beth Eom for assistance with the RNA integrity experiment. Kittel, P. Advances in Cryogenic Engineering. Springer. 41 (1996). Edeskuty, F. J., Walter, F. Stewart Safety in the handling of cryogenic fluids. Plenum Press. New York. (1996). Council, N. R. Prudent Practices in the Laboratory: Handling and Management of Chemical Hazards. National Academies Press. (2011). Muyal, J., Muyal, V., Kaistha, B., Seifart, C., Fehrenbach, H. Systematic comparison of RNA extraction techniques from frozen and fresh lung tissues: checkpoint towards gene expression studies. Diagnostic Pathology. 4, 9 (2009). Sambrook, J., Russell, D. W. Molecular cloning: a laboratory manual. Cold Spring Harbor Laboratory Press. (2001). Holland, N. T., Smith, M. T., Eskenazi, B., Bastaki, M. Biological sample collection and processing for molecular epidemiological studies. Mutation Research/Reviews in Mutation Research. 543, 217-234 (2003). Lynch, P. T. CELL, TISSUE AND ORGAN CULTURE | Storage and Cryopreservation. Encyclopedia of Rose Science. 106-111 (2003). Crawford, R. J. Plastics Engineering. Elsevier Butterworth-Heinemann. (1998). Gorenc, B., Tinyou, R., Syam, A. Steel designers' handbook. University of New South Wales Press. (1996). Harper, C. A., Petrie, E. M. Plastics materials and processes: a concise encyclopedia. Wiley-Interscience. (2003).